To access the setup menu, hold both the left and right arrows together for 6 seconds. Pressing the left and right arrows momentarily will show the SAVE PARAMETERS menu. Continue to hold for 6 seconds until you see AUTO TRIM or EL TRIM. This function is only available in the latest versions of software. The AUTO TRIM function automatically adjusts the azimuth elevation trims, and the auto threshold value. If the antenna is not tracking a satellite, this feature is not available and will show AUTO TRIM LOCKED. To activate auto trim the antenna must be tracking, and if modem lock is activated in the system type the modem must be locked. Press the left arrow to edit mode. The display will show AUTO TRIM SETUP and press ENTER. Even though the screen shows AUTO TRIM SAVED, it is still necessary to do a SAVE PARAMETERS, or the new values will be lost when the DAC is reset. In the latest software 6.08g the elevation will move up 10 degrees to measure the off satellite AGC and then come back on satellite and measure the on satellite AGC to calculate the new AUTO THRES value. The EL TRIM and AZ TRIM values will also be adjusted. You can then read the new values in the following two screens. The EL TRIM and AZ TRIM function allows one to tweak the target elevation and azimuth to find the satellite more quickly. This can be done automatically using the AUTO TRIM function above, or manually if your software does not have the AUTO TRIM feature. This is only necessary if the antenna struggles to find the satellite or requires assistance to find the satellite. 1. Press NEXT to escape from the setup menu and go to the AZ-EL (Antenna) menu and make note of the Azimuth and Elevation while the antenna is tracking the satellite. 2. Go to SAT menu, and retarget the satellite. Immediately press NEXT a couple of times to view the AZ-EL (Antenna) menu again. The elevation will move up 10 degrees to read the off satellite AGC and then come down to the target elevation and begin to search. 3. Make note of the target elevation and azimuth at this point. If the antenna can not find the satellite, you might need to give it some assistance using the up/down and left/right arrows to drive it back to the position noted in step 1. 4. Calculate the difference between the tracking elevation and the target elevation. We need to use the EL TRIM to change the tracking elevation to read the same as the target elevation, so that next time it targets it will be right on satellite. For example, If the antenna is tracking the satellite at 2.5 degrees above where it targeted the satellite we need to reduce the tracking elevation by 2.5 degrees to agree with the target elevation. 5. To do this, go back to the setup menu, to EL TRIM. Press the left arrow to edit mode and use the up and down arrows to change the EL TRIM. NOTE THAT THE DIGITS REPRESENT 1/10TH OF A DEGREE (0010 is 1 degree). To get negative numbers simply go below zero with the down arrow. So in our example, we would need to subtract 2.5 degrees (-0025) from the existing EL TRIM setting. ( If the EL TRIM was -0015 it should now be -0040). 6. Press NEXT to go back to the AZ-EL (Antenna) menu and the Elevation should now read the correct target value that you noted in step 2, while the antenna is still tracking the satellite. If the required EL TRIM is more than a few degrees, you may have a problem with the level cage, or level cage motor, or the antenna may need to be re-initialized. 7. Calculate the difference between to tracking azimuth and the target azimuth. We need to change the tracking azimuth to read the same as the target azimuth using the AZ TRIM. For example, If the antenna is tracking the satellite a 6 degrees below where it targeted the satellite we need to increase the tracking azimuth reading by 6 degrees to agree with the target azimuth. 8. Go back to the setup menu, to AZ TRIM. Press the left arrow to edit mode and use the up and down arrows to change the AZ TRIM. NOTE THAT THE DIGITS REPRESENT 1/10TH OF A DEGREE (0010 is 1 degree). 6. Press NEXT to go back to the AZ-EL (Antenna) menu and the Azimuth should now read the correct target value that you noted in step 2. AZ TRIM can can sometimes be a large value depending on how the antenna was mounted on the vessel. With VSAT antennas, large numbers of AZ TRIM should be reduced by adjusting the home flag magnet or setting the homeflag offset. With dual, limited azimuth (unwrap) TV antennas, where one is often mounted facing the stern to avoid both antennas unwrapping at the same time, it is necessary to add 180 degrees of AZ TRIM to compensate. It is necessary to SAVE PARAMETERS after changing the EL TRIM or AZ TRIM or the new settings will be lost when the DAC is reset. The threshold is the preset AGC signal level that determines when the antenna is tracking the satellite and when it is off satellite. If AUTO THRES is set to 0000 then the threshold can be manually adjusted in the SAT menu. The AUTO THRES setting will determine how many AGC counts above the off-satellite noise floor the theshold will be set. Each time the antenna targets the satellite, the elevation moves 10 degrees above where it expects to see the satellite (confident that there are no satelites up there), to measure the background, off-satellite AGC. It then adds the AUTO THRES value to that level and sets the new THRESHOLD. So if the off-satellite AGC reading was 1640 and the AUTO THRES was set to 0100 then the new THRESHOLD will be 1640 +0100 = 1740. The THRESHOLD should be set to about midway (or slightly less) between the on-satellite and off-satellite AGC levels. The default setting of 0100 is usually sufficient in most circumstances. In the latest software the AUTO TRIM will adjust the AUTO THRES automatically. This is not used for Dish Scan and should be set to the default 0000. After losing track of the satellite, the antenna will wait for the time specified in the SEARCH DELAY before retargeting the satellite. If it does not find the satellite it will begin a search by moving up one step of the SEARCH INC size in azimuth, followed by a step up in elevation, followed two steps down in azimuth, continuing to increase in a spiral patern until the satellite is found (AGC goes above threshold) or the preset SEARCH LIMIT is reached. If it has not found the satellite it will then return to the center (or to the target) and begin to search again after the preset SEARCH DELAY period. 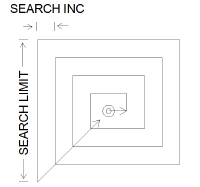 SEARCH INC (0010 or 0020) is the size of each step increment that the antenna makes when searching for the satellite. Depending on the antenna the unit is 12 or 24 units per degree. SEARCH DELAY (0030)is the time in seconds that antenna will wait befor initiating a search. The system type turns various options on and off. It is set during installation and should not normally need to be changed. The options are added together to result in the system type number that is entered in this screen. So, for example a system type of 7 includes 1=Auto Sat Load on reset, 2 Enable modem Lock, and 4 Auto Sat load after search failure. The SeaTel System Type Calculator allows one to include and remove features to automatically calculate the number to enter as the SeaTel System Type. Including a 1 in the system type will cause the antenna to target the satellite when the system first initializes, and also when the reset button is pressed. Without this, the antenna will wait for the operator to manually target the satellite. Including a 2 in the system type will cause the antenna to look for a signal that the modem has receive lock, for confirmation that it is on the correct satellite. NID must also be set to 0000. If it does not see the signal from the modem, it will assume that it is not on the correct satellite and retarget the satellite continuously every 20 or so seconds. This signal is passed from the modem console port on the RJ45 cable pin 2, or on the external AGC connection on the terminal mounting strip. By default, the antenna expects this signal to go LOW (0 volts) when the modem is locked and HIGH (15V max) when the modem is unlocked, which is the case for iDirect and Comtech modems. With a Hughes modem, the signal is reversed (HIGH=modem lock). In this case 128 needs to be added to the system type to reverse modem logic. Including a 4 in the system type will cause the antenna to retarget the calculated target satellite at the end of an unsuccessful search. Without this enabled, the antenna will return to the center of the search pattern, which may not be the calculated target satellite. Including a 16 in the system type will reverse the Tx mute blockage output on SW2 or on pin 7 of the RJ45 connector (HIGH=BLOCKED). By default, the output is low (TTL closed) when the antenna is blocked, searching or mispointed by 0.5 degrees. This is needed for an iDirect or Comtech modem that require a HIGH=MUTED signal. The Hughes modem does not require this option as it uses a LOW=MUTED signal. Including a 64 in the system type causes the DAC to provide DC power to the LNB on the receive coax. The VOLT setting in the SAT menu determines the voltage. HORZ/LHCP=18V and VERT/RHCP =13V. Older VSAT systems require LNB power from the DAC while the newer systems generate the LNB power in the antenna controlled in the STATUS menu (Xp B2). TV systems using a multiswitch require the DAC to provide "LNB" power to be able to select polarity on the multiswitch (VERT=13V, HORZ=18V) for tracking purposes. On the recent 6.08g DAC software, including an 8 in the system type will reverse the Tx Pol logic. By default Tx Pol of 0002 is Vertical and 0004 is horizontal. Including system type 8 will reverse this. This could be important with systems using automatic beam switching, as the modem will command Tx Pol using the standard polarities. It is important to remove the 8 from the system type when upgrading DAC software above version 6.08g. On the old 4003s and 9797s the narrow band DVB tuners had an automatic frequency control (AFC) in NBIF mode where the tuner would adjust the frequency every two minutes. This was also activated using an 8 in the system type. The old default Marlink system type of 95 includes an 8 which should be removed when upgrading a DAC 2202 above version 6.08g. This is required for modems, like the Hughes modem, that send a HIGH signal when the modem has receive lock. System type 2 (Modem Lock) also needs to be activated. In the Azimuth Entry screen (second screen of the Antenna menu), including a 32 in the system type will cause the REL to be displayed in the bottom left hand corner, rather than the Azimuth and Elevation commands. This i9s a feature seldom used. The most common gyro compasses today put out a NMEA 0183 heading signal or or have converters converting to NMEA or stepper. Gyro Type 0002 covers both NMEA and step-by-step. Other gyro types are various types of Syncro with A/D converters and Gyro Type 0 for no compass input to activate a special Azimuth Search sweep to find the satellite. With Polang Type set to 0072 the polarization will adjust to the correct setting for the satellite, calculated from the ships position and the satellite longitude. For manual mode the Polang Type is set to 0009. This allows the Pol angle to be changed in the Antenna menu. Manual mode can be used during a polang lineup with the NOC, or it can be left in AUTO mode and adjusted using the polang offset. For most VSAT antennas the default Pol Offset is 0040 with a center of travel at pol 130 (40+90). TV antennas use a Pol Offset of 0030 with center of travel at 120 (30+90). It is usually not necessary to adjust the pol offset for TV antennas if the feed is correctly installed. The Pol Offset is added to the polarization that the antenna calculates as the target Pol. The Pol Offset does not modify the Pol reading in the Antenna screen that comes directly from the polang potentiometer on the feed. It changes the angle that the feed moves to when targeting the satellite. If the antenna calculates a Pol angle of 90 degrees, the target Pol will be 90 + the Pol offset or 40 = 130. When doing a crosspol lineup with the satellite NOC, it is easiest to adjust the Pol Offset in Auto Pol mode (0072) rather than going to manual. Leave the system in Auto mode and go to the POL OFFSET screen. When the NOC asks you to rotate the feed, give them the starting point as a reference (example 40) and then adjust the pol offset one degree at a time. Use the left arrow to edit mode and set the cursor under the last digit. Use the up or down arrow to change it 1 degree and press ENTER. Allow 5 seconds for the feed to settle, and then tell the NOC the new reading. Continue to adjust the pol offset up or down under direction from the NOC until the optimum pol angle is attained. Exit by pressing NEXT and then SAVE PARAMETERS. To visually check the Pol Offset, set the TX POL to 0002 and target an imaginary satellite at the ships own longitude. If the longitude is 80W set SAT=80W. The target light will come on an the Pol angle in the Antenna menu will go to about 130. Go to the antenna and verify that the feed (and LNB) is (square or at right angles) with the antenna. If it is not, the Pol Offset needs to be corrected, or if it is way off, the polang pot will need alignment. One should always conduct a crosspol test with the NOC after making any adjustment to the feed angle. Pol scale is almost always 0090. This is the amount that the Pol count in the Antenna (AZ-EL) menu changes when the feed is rotated 90 degrees. Some obscure, older antennas could have a pol scale of 60 depending on the polang potentiometer. BLOCKAGE ZONES: The azimuth limits describe the area of relative azimuth (REL) where the antenna is blocked by the mast or other obstructions on the vessel. It is also used to prevent the antenna transmitting (Tx Mute) in certain directions, perhaps where ship's personnel would be in danger of radiation. In the case of dual antennas with an arbitrator it indicates that the antenna is blocked and that the arbitrator should switch to the other antenna. The blockage zones correspond with the REL (Relative Azimuth) readings in the Antenna menu. If the antenna is not mounted with the home flag on the bow of the vessel, then this will need to be compensated in the blockage settings. If at all possible, VSAT home flag magnets should be adjusted accurately on the bow to simplify blockage angle calculations, especially on dual VSAT installations. This is not possible on limited azimuth, TV antennas. Three blockage zones can be set, always in a clockwise direction, using the beginning azimuth of the blockage zone (AZ LIMIT 1) set from REL 0000-3600, the end limit of the blockage zone (AZ LIMIT 2) set from REL 0000-3600, and the elevation of the blockage (EL LIMIT 12) set from 0000-0900 degrees. The elevation defaults to 0900 or 90 degrees which would be total blockage from say a tall mast, but if the blockage only extends up to say, 45 degrees, then this could be changed to 0450 to allow the antenna to operate above this level. 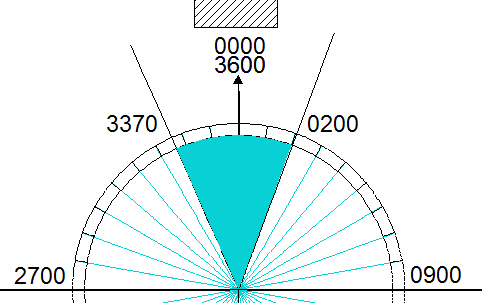 On limited azimuth, TV antennas where the Relative actually rotates from 0023 through 0687 the blockage zones are still set from 0000 to 3600 with 360 being the bow of the vessel. In the case of dual TV antennas, the second antenna is often mounted 180 degrees off, with REL 360 facing the stern, to avoid both antennas being in unwrap mode at the same time. In this case the blockage zones of the second antenna will need to be compensated 180 degrees. The second and third blockage zones are set in the AZ LIMIT 3 & 4, EL LIMIT34 and AZ LIMIT 5 & 6, EL LIMIT 56 menus. Blockage zones can be set to overlap, where one blockage zone is at one elevation and another blockage zone is at another elevation. It is best to set blockage zones by checking actual performance on different headings, as antennas can often see past surprisingly large blockages. Tx Polarity switches the polarity by 90 degrees from horizontal to vertical and vice versa. On most antennas, Tx Polarity of 0002 is vertical and Tx Polarity 0004 is horizontal. Some earlier antennas have this reversed, depending on how the feed was set up. The receive pol will, of course be the opposite. Note that from DAC 2202 software 6.08g the system type including 8 will cause the Tx Pol to be reversed. One may need to switch Tx Polarity when changing satellite beams. Track Display changes the options in the Status Menu to accommodate the newer antennas that provide LNB power and tone switching for multi band LNBs in the antenna rather than via the coax from the DAC. It also allows switching of LNB coax relays using the Aux signal. For a quad LNB with copol and crosspol options the default Track Display is set to 0130. The Status display will then show Xp B1, Co B2 etc. On legacy systems that provide LNB power from the DAC, the track display should be set to 0000. The Status Menu will show KuHi/KuLo/C or X options. These are used to switch coax relays on pedestal on multiband antennas. The Aux signal on controls the selection coax switch in the radome to select LNBs and SW1 on the TMS. Parameters must saved to NVRAM after changes are made, otherwise the changes will be lost when the DAC is reset. To save parameters, press the left arrow again to edit mode, and ENTER. PARAMETERS SAVED will be displayed. Remote commands control the setup of the pedestal control unit. These should normally not be changed except during setup and diagnostics. 72822 visits to this page since 28 Nov 2012.